Prior to the tournament, Cameroon's most high-profile player was Joel Matip of English Premier League side Liverpool but like some half a dozen others, the defender refused to honour his call-up for the 2017 finals. The players' excuses ranged from differences with the federation to not wanting to leave their clubs midway through the European season. Yet their absence galvanised those who did travel to Gabon, where even a mid-tournament row over player bonuses refused to distract this generation of Indomitable Lions, as the team is known. What was notable about that dispute - which saw the players offered a bonus for reaching the semi-finals that was somehow four times smaller than that offered for the quarter-finals - was the way in which coach Hugo Broos publicly backed his players. "Even without the money, we are still performing and this is very important - it shows that the players are not here for the money, but for the nation," he told the world's media. Little loved when he took over despite a trophy-laden CV in his homeland, the Belgian has performed a mightily-impressive job in his first national team coaching role. Not only has he consistently said the right things at the right times, he also scoured far and wide for players - one member of the squad plays in Angola - and impressed both tactically and with his swift decision-making. Note the way in which he dropped right-back Ernest Mabouka, who struggled in the opening game, while also being brave enough to change his strikers throughout the group stage as he sought the best format. The bedrock of Cameroon's success was their defence. Just 21, goalkeeper Fabrice Ondoa kept the side in the tournament with a stoppage-time block against hosts Gabon in their final group game before saving decisively against Senegal's Sadio Mane in the quarter-final penalty shoot-out. Ahead of Ondoa, who can't even get a game for Seville's B side in Spain, the central defensive pairing of Adolphe Teikeu and Michael Ngadeu - Cameroon's top scorer - were immense. A disciplined unit, they were alert to danger thanks to their excellence in the air and impressive reading of the game - despite only having first played together in September. Guarded against Senegal, Cameroon then threw caution to the wind against Ghana in the semi-final and reaped their reward with a convincing 2-0 win. In the final itself, this team - whose unity was ever clearer to see - showed yet more courage when coming from behind after Arsenal's Mohamed El Nenny opened the scoring early on. Egypt had not lost a Nations Cup match since 2004 - a run of 25 games - but after Nicolas Nkoulou equalised, Vincent Aboubakar produced a moment of magic two minutes from time as he lifted the ball over Ali Gabr to fire home a dramatic winner. 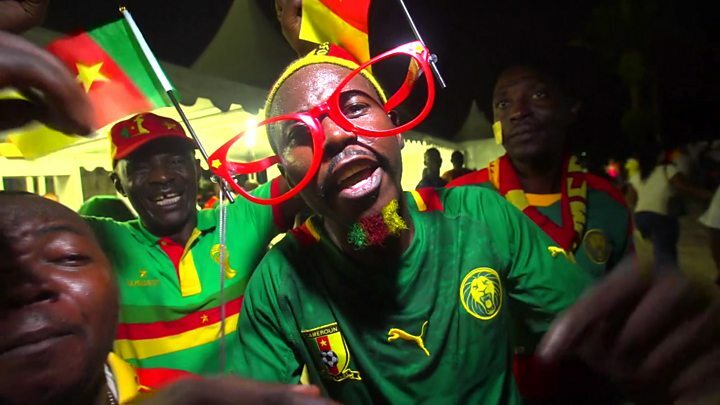 Thrown on by Broos at half-time, the substitute was, incredibly, the first Cameroonian striker to score in Gabon. Special mention must also go to captain Benjamin Moukandjo, man of the match in the final, and Christian Bassogog, the pacey 21-year-old named Player of the Tournament - and who has been a delight to watch. Two years ago, the winger was playing in the third tier of American football - but after a move to Denmark, where Broos scoured the opinion of some friends, the left winger earned his first cap. That was just 12 weeks ago. 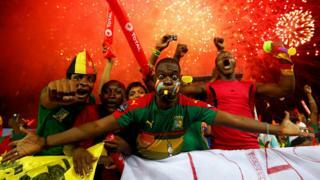 Having overcome countless challenges en route to winning a first title since 2002, the looks on Cameroonian faces following the final whistle summed up their achievement. Many of the players simply struggled to believe they had done it - one final twist in a tournament full of surprises - but one which was hugely merited.